Police stand guard at a house on Mallory Crescent in Toronto on Jan. 30, 2018. Police are investigating the property in relation to the murder charges laid against Bruce McArthur. 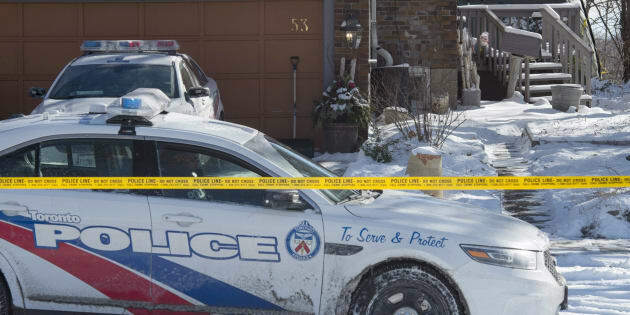 TORONTO — More murder charges are expected to be laid against a self-employed landscaper already accused in the presumed deaths of five men, as investigators continue to search properties linked to Bruce McArthur, Toronto police said Wednesday. Police have said that investigators had found two planters with the skeletal remains of three individuals, but Det. Sgt. Hank Idsinga told reporters Wednesday there are still more than a dozen planters that need to be processed by forensic teams. McArthur, 66, was arrested and charged Jan. 18 in the presumed deaths of Selim Esen, 44, and Andrew Kinsman, 49, who police said went missing from Toronto's gay village last spring. Selim Esen, left, and Andrew Kinsman, right, are seen in police handout photos. He was further charged Monday in the deaths of two missing men — Majeed Kayhan, 58, and Soroush Mahmudi, 50 — as well as Dean Lisowick, who was in his 40s when he went missing. Soroush Marmudi, Dean Lisowick and Majeed Kayhan (left to right) are shown in police handout photos. Investigators plan to also excavate part of the lawn at a home in uptown Toronto where McArthur was known to have worked, Idsinga said Wednesday, adding that the work may start later this week or early next week. He said police have set up heaters on the property where the excavation work will take place to keep the ground from freezing. A police officer carries containers outside a house on Mallory Crescent in Toronto, where Bruce McArthur did landscape work, on Jan. 29 , 2018. Meanwhile, investigators are also searching the basement of the home on Mallory Crescent, but Idsinga said cadaver dogs did not detect anything that prompted the search. Since McAruthur's arrest, Idsinga said police have received dozens of tips and are continuing to investigate "well over 30'' locations linked to him. They also continue to encourage homeowners who hired McArthur to reach out so their properties can be searched. Idsinga also said tips have come in from around the world, adding that police may also look into cases where people who have come to the city have not returned to their home countries, as well as homicides outside Toronto. The Toronto Police Service is facing considerable backlash for initially shutting down fears in Toronto's LGBTQ community that a serial killer was prowling the gay village. Officials, including police Chief Mark Saunders, stressed that as recently as December police did not know whether Esen's and Kinsman's disappearances were linked or if they were alive. CORRECTION: An earlier version of this story stated that Dean Lisowick was 47 years old, which is the age originally reported by police. However, police later said he was 43 or 44 years old when he went missing.